The form editor is divided into three areas: Navigation, Body, and Explorer. Located on the left side, use the navigation area to control access to related entities or to add links to URLs to be displayed in the main pane of the form. To edit navigation, you must first select the Navigation command in the Select group of the Home tab. 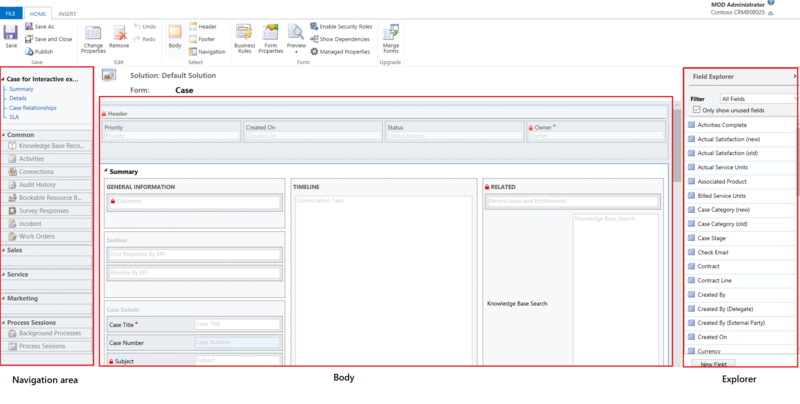 Located in the center, use the body area to control the layout of the form. You can select and drag form elements to position them. Double-clicking on an element will open the properties for the element. 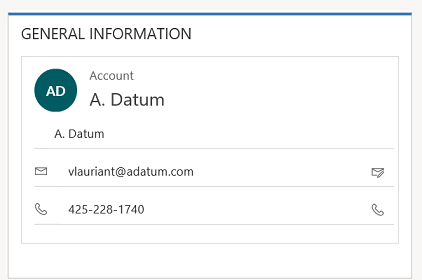 By default, for the Case, Contact, and Account Main forms, the first section under the Summary tab shows the account or contact card form of type Quick View. For custom entities, this section is not available by default. You can insert a new section and a quick view form in it. The card form shows a maximum of five fields. Other than fields, it isn’t possible to show other controls in the Blue tile even if the quick view form contains it. To preserve the card format (as shown in the following image), we recommend that you do not move the quick view form to any other section on the form. To add a field, select it from the Field Explorer and drag it into a section. To add an element that is not a field, select where you want to place it and use the appropriate command from the Insert tab add it. To remove an element, select it and use the Remove command in the Edit group of the Home tab. To edit the Header or Footer for the form you must first select the corresponding command in the Select group of the Home tab. Located on the right side, the content of the explorer area depends on the context. When you select Body, Header, or Footer in the Select group of the Home tab, you’ll see the Field Explorer. Use the Field Explorer to drag fields you want to display into a section in the form or within the header or footer. You can include the same field multiple times in a form. Use the New Field button as a shortcut to create a new field. When you select Navigation in the Select group of the Home tab you’ll see the Relationship Explorer. Drag any of the relationships into one of the groups within the navigation area. You cannot add the same relationship twice. Relationships are available based on how they are configured. If you configure a relationship to not display, it won’t display in the Relationship Explorer. For information about how to configure default display options for relationships, see Navigation pane item for primary entity. You can use the New 1:N and New N:N buttons as a shortcut to add new entity relationships. Save Save (Ctrl+S) Save the form. Save As Create a copy of this form with a different name. Save and Close Save the form and close the form editor. Edit Change properties Change properties of the selected item in the body. Remove Remove the selected item. Undo (Ctrl+Z) Undo the previous action. Redo (Ctrl+Y) Redo the previous action. Select Body Edit the main body of the form. Header Edit the form header. Footer Edit the form footer. Navigation Edit the form navigation. Form Business Rules View, edit, or create new business rules with the Business Rules explorer. Note: For the interactive forms, only the “Entity” and “All Forms” scope is supported. Preview Use this to see how form looks after it is published. You can also preview to test scripts associated with from events. Enable Security Roles Use this to set which security roles will have access to the forms. More information: Control access to forms Important: If you create a new form, only the System Administrator and System Customizer security roles will have access to the form. You must assign access to other security roles before people in your organization can use it. Section Add a section to a selected tab. You can include a section with one to four columns. You can also insert a Reference panel in the interactive forms. Reference panel is also added as a section to the Main - Interactive experience form. By default the Reference panel section is added to the Case, Account, Contact and custom entity forms. 3 Tabs Three Columns Insert a three-column tab with equal widths. Three Columns Insert a three-column tab with a wider middle column. 2 Tabs Two Columns Insert a two-column tab with a wider right column. Two Columns Insert a two-column tab with a wider left column. Two Columns Insert a two-column tab with equal width columns. 1 Tab One Column Insert a one-column tab. Control Sub-Grid Format a sub-grid and insert it into the form. Spacer Insert an empty space. Quick View Form Insert a Quick View Form. Web Resource Insert a web resource to embed content from other locations in one page. IFRAME You can add IFRAME to a form to integrate content from another website within a form. Timeline Insert a timeline control in the form. This control shows the timeline of activities related to the entity on a form. Navigation Link Using this option, you can insert a link into a form navigation. Relationship Assistant Using this option, you can insert a relationship assistant control in the form.